So we have done all the numbers so you don't have to worry about it. 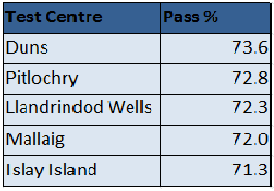 Following table is the list of Top 5 test centres in UK with respect to passing percentage on your driving test. There you go. If you live near to any of these test centres, you will have a better chance of passing your driving test. However it all depends on your driving on the test. The data provided above is for the year 2017 - 2018 and is derived from the official DVSA website. The numbers are rounded off to the nearest whole number.